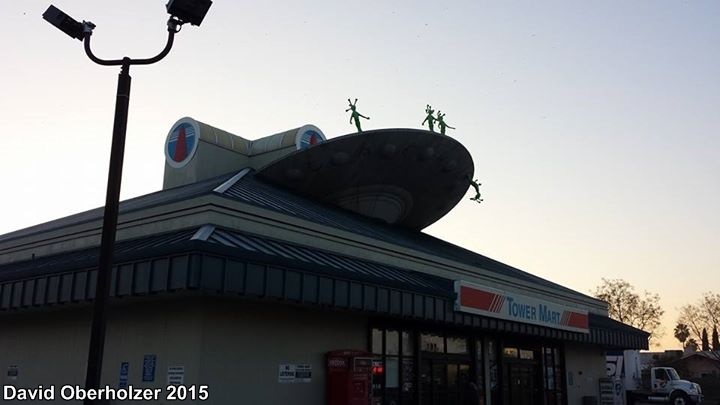 Aliens have invaded the Tower Mart in Lathrop! In Lathrop a 30 foot diameter saucer has crashed into their convenience store, just off of Interstate 5. The UFO's occupants, little green guys, have, of course, spilled out to cause chaos throughout the store, and can be seen doing things to milk, eggs, and other grocery items in many of the store's aisles. Never mind trying to fix their alien ship and go home; they clearly are happy to just stay and enjoy terrorizing the convenience store. 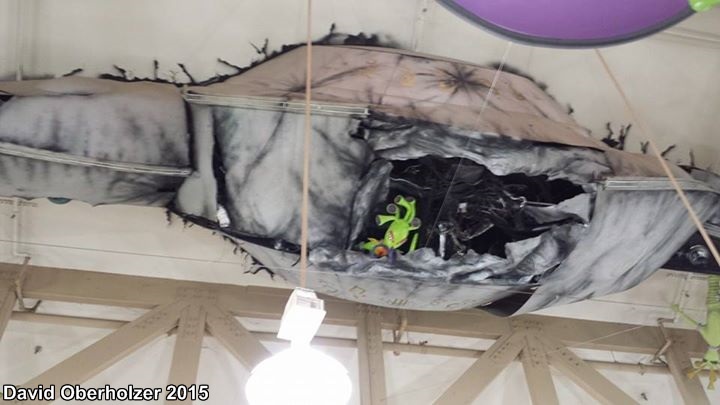 Additionally, you can see the other half of the flying saucer poking through the roof into the inside of the store, with a nice gaping hole in its hull. If you're trying to shop in the store, it's literally crawling with green aliens, green alien goo, and some additional extra purple flying saucers for good measure! So if you're looking for aliens and aren't in Area 51, then Lathrop is for you! The other Tower Mart stores in the chain do not have an alien infestation going on; they must pay their alien protection fees. Two other stores in California have been invaded by aliens: Fry's in Burbank and a jerky shop in Baker.